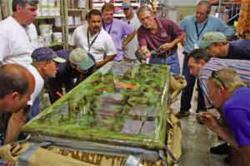 enCOUNTER Offers Professional Concrete Countertop Training to the Do-It-Yourself Market! 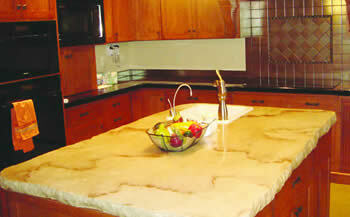 Upcoming Training Class in August Teaches How-To Concrete Countertops for Outdoor Kitchens!
" My goals were to create and provide a professional concrete countertop system that eliminated the hassles of the concrete countertops cracking and staining; defects commonly found in other systems on the market." enCOUNTER professional countertop based out of Oklahoma City OK is an industry leader and manufacturer of professional quality concrete countertop mix and design. The company was developed by a seasoned veteran in the concrete field, Doug Bannister. " My goals were to create and provide a professional concrete countertop system that eliminated the hassles of the concrete countertops cracking, curling, and staining; defects commonly found in other systems on the market," he states. Today, enCOUNTER is the leader in providing products, tools, training and customer support needed to create functional, beautiful, long-lasting, and multi use concrete countertops for kitchens, bath vanities, tabletops. Even vertical wall surfaces can be accomplished using Thin Wall Technology, in any home or business. Through a variety of how-to-training methods - enCOUNTER offers different ways to get started in the DIY concrete countertop journey. They offer a comprehensive DVD, a simple book called Casting Concrete Countertops for do-it-yourselfers who want to undertake a small countertop project, and in depth hands-on-training at their location in Oklahoma City. Classes are also available at their multiple distributor locations across the US. The upcoming concrete countertop training class held on August 5th, 2011 will be featuring countertops for outdoor kitchens. This class will teach the versatility of concrete specifically for outdoor use. Coloring, reinforcement and protective coatings as well as polishing and special effects will be taught. To learn more about concrete countertop training, visit the company website at: http://www.encountertop.com/training.php for all the details, information and to reserve a spot.